I’m rather particular and somewhat picky when it comes to buying outerwear. I actually used to avoid shopping for coats simply because they tend to be so expensive! While I’d be the first to admit they are a necessary wardrobe staple (I’m always cold), it’s just sometimes difficult to justify those big purchases, especially if you don’t want to wear just one style all season long. So, as you can imagine, when Lands’ End reached out asking me to pick out a coat, I was overjoyed! Lands’ End is based in frosty Wisconsin, so you know they have the right goods. I was in need of a classic short peacoat style (can you believe I didn’t already have one? ), and spotted this one on the website and fell for it instantly. This coat feels like a million freaking bucks! I’m not even kidding. It’s incredibly soft and the fit is just perfection – I’d almost compare it to cashmere. This coat comes in a variety of colors, but the creamy caramel-y hue stood out. As you can see from these photos, this coat does not look inexpensive – but you’d be happily mistaken! It’s just under $180. If you live up north and need something a bit heavier, try the insulated version of this coat! Perfect indeed! Color and style. You look so elegant, I love that dress and what a pretty coat. You look so lovely in this coat! I adore this dress and your heels. Perfect outfit for a night out! Very pretty! Love a nice peacoat! That Erdem dress is absolutely stunning. 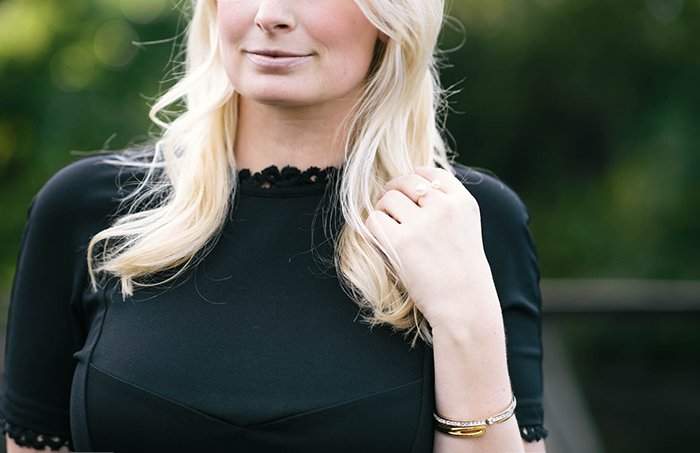 The perfect LBD. The collar on that dress is just gorgeous! I have a long puffer LE coat that I wear to football games throughout the season (and on seriously cold days) that I couldn’t live without! I love this look! You look so pretty! That coat is gorgeous, its the perfect color. So incredibly classy! 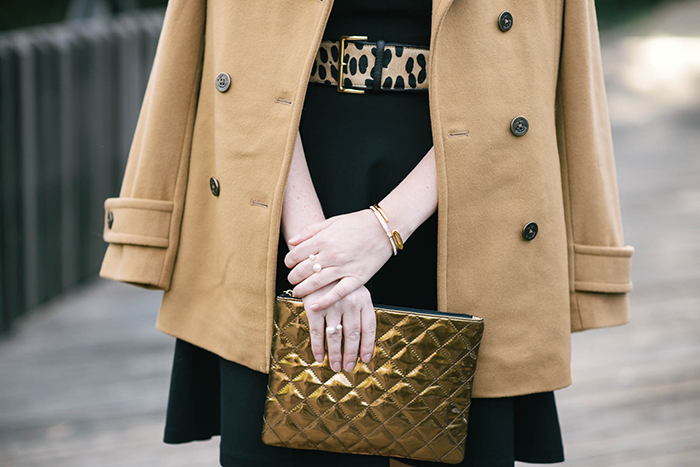 An LBD, camel coat and a pop of leopard is the epitome of elegance. Doesn’t get any better than this. Hey Steph! I ordered the size 8 Tall (I love my coats long and I like to make sure I can wear bulky sweaters under all my coats)! Gorgeous! Nothing like black and camel! Loving the details on the dress, beautiful! This dress is stunning on you! It fits you perfectly. I love how you paired it with than. I am so into that color combo for this season. Such a classic and timeless look! You can never go wrong with a simple pea coat. I love the camel hue as well. Also loving your LBD and that gorgeous leopard belt! The pop of metallic from the bag really made this look a killer! Love it! STUNNING! All of these pieces are perfect —- the camel coat, your belt, the dress and that gold clutch, YES! This is a beautiful color combo! I love the black and camel, but the addition of gold and leopard is perfect! You always know the best way to accessorize! Love that dress, love anyything Erdem! Love this look, especially the belt and bag. I need both of these. I really need to invest in a camel coat. This is so pretty! I love the dress and the clutch! I’m really loving your classic and elegant style lately! You look gorgeous. This is so cute! I love the detailing on your dress! What a nice outfit! In love with that black dress! You look so gorgeous as per usual! Love this peacoat! I love the color and the detail! Simple yet very chic! I am just like you – I am always cold!! I love a good coat and although they are so expensive, they are worth the investment. But finding a good coat at an inexpensive price is the best! You look stunning with that belt and LBD! Yeah, I’m in frost Wisconsin and it’s already awfully cold and snowy! This is a beautiful cold-weather option! I’ve been wanting a camel coat- this is a beautiful option! Love it with the LBD, leopard belt and metallic bag! That is a perfect peacoat! Love it. And that dress is gorgeous! I can't believe I'm just finding your blog!